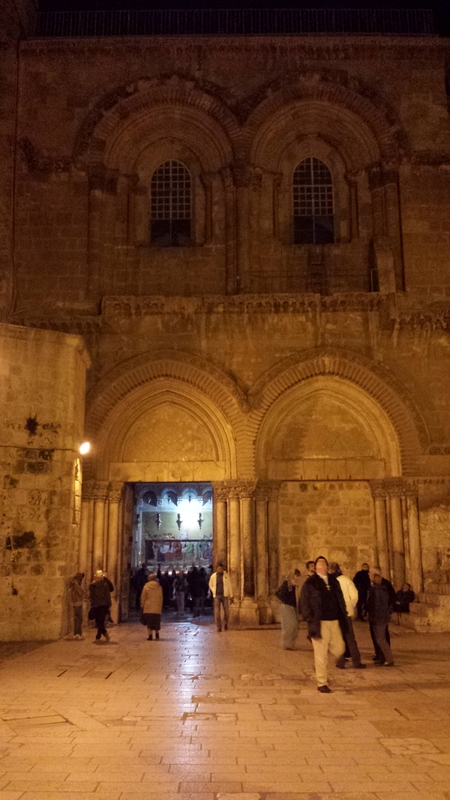 After breakfast at the hotel, we set off in the early morning for a quick bus ride to the Lion’s Gate in order to the Church of St. Anne, located near the start of the Via Dolorosa and in the Muslim quarter of the Old City. 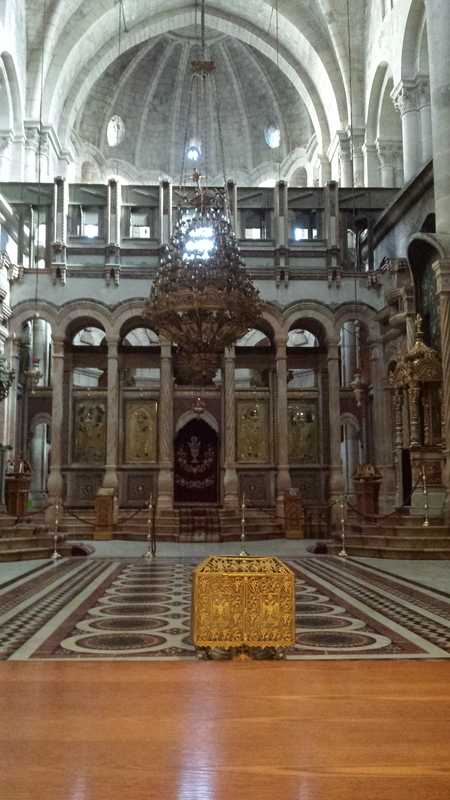 The church was built near the remains of a Byzantine basilica, over the site of a cave home believed by the Crusaders to be the birthplace of Mary, mother of Jesus. The church is dedicated to her parents, Anna and Joachim who are said to have lived there. However, another strain of Christian tradition says that Mary was born in Sepphoris, which is very near Nazareth. 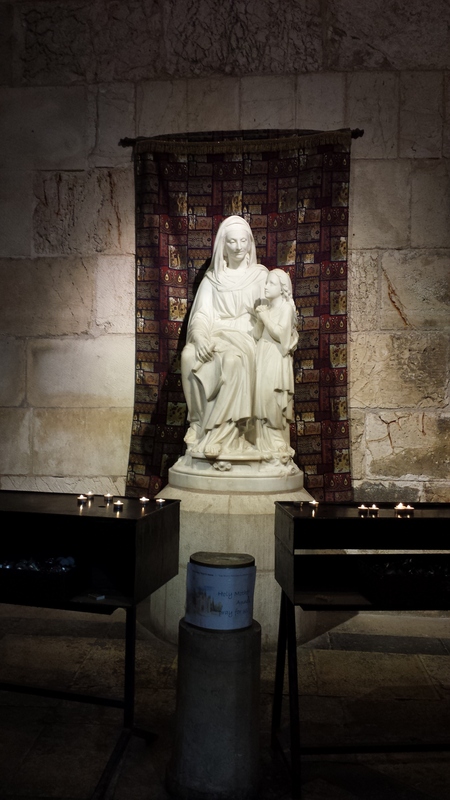 Statue of Anne with her daughter, Mary (Mother of Jesus). 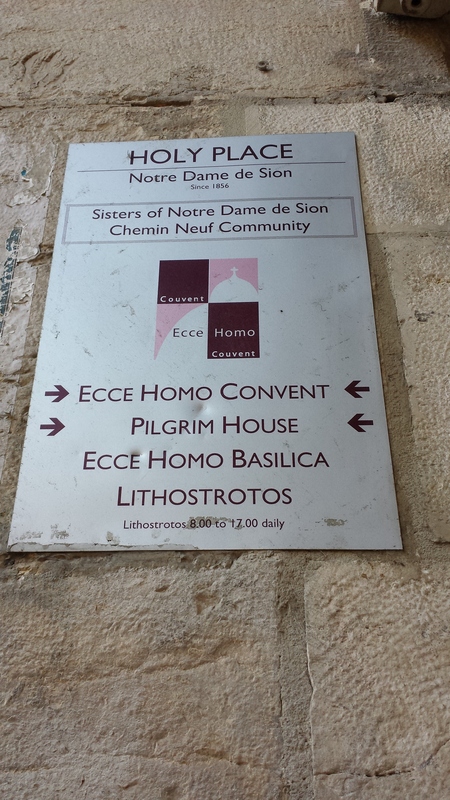 Unlike most Christian churches, St. Anne’s was not destroyed after Sala ad-Din’s conquest of Jerusalem in 1187, though it was converted into a Muslim seminary. Technically, for reasons of history, the church belongs to the French government, and it is administered by the White Fathers of the Catholic Church. 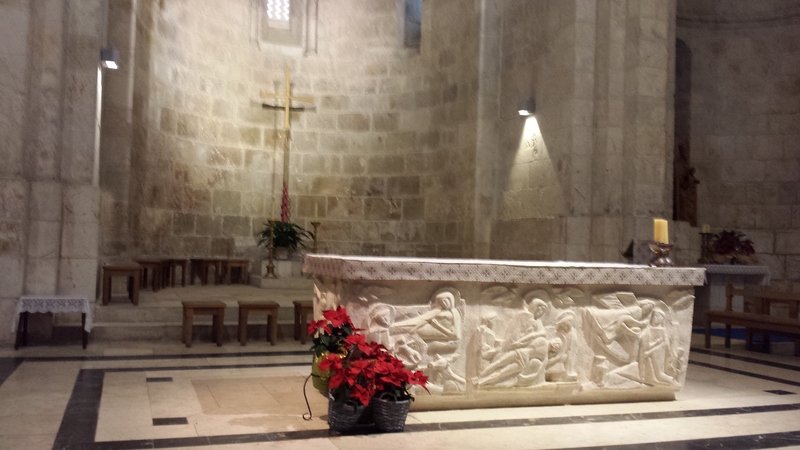 Due to a high Roman vaulted ceiling, St. Anne’s has amazing acoustics that are perfect for chanting and singing. Our group held a brief prayer service and sang a hymn. 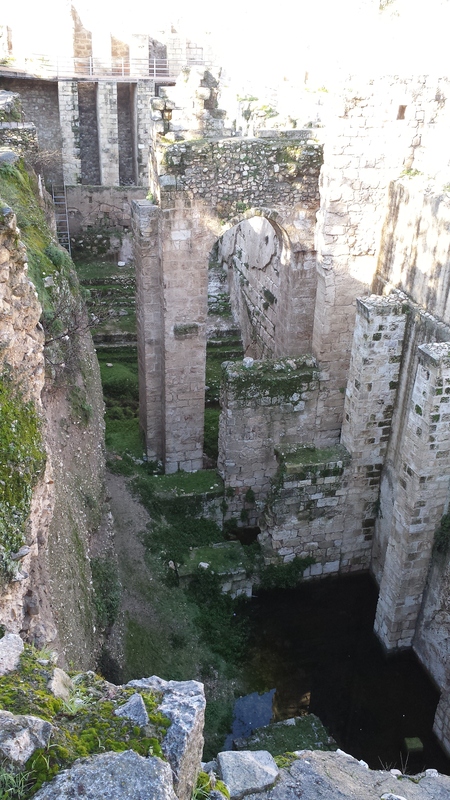 Next to the church are the healing pools of Bethesda. 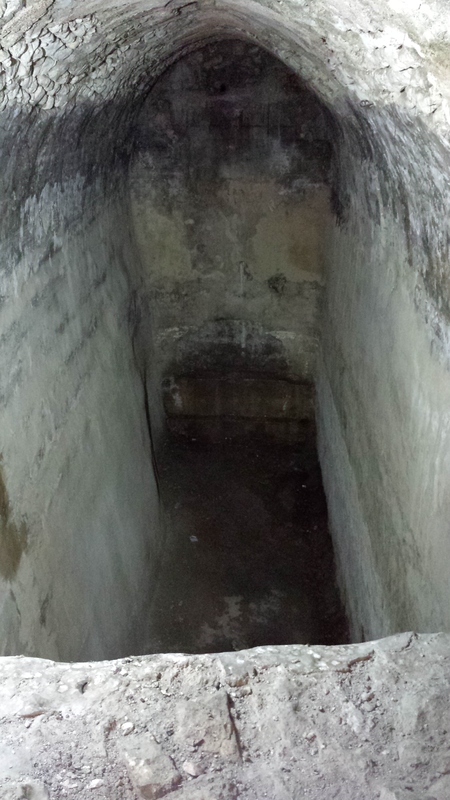 During the Roman period, the pools were a Roman shrine to the Greek God Asclepius, the god of healing. The Gospel of John describes the existence of this pool, noting its five colonnades in the story of Jesus healing a crippled man during the Sabbath (John 5:2-9). 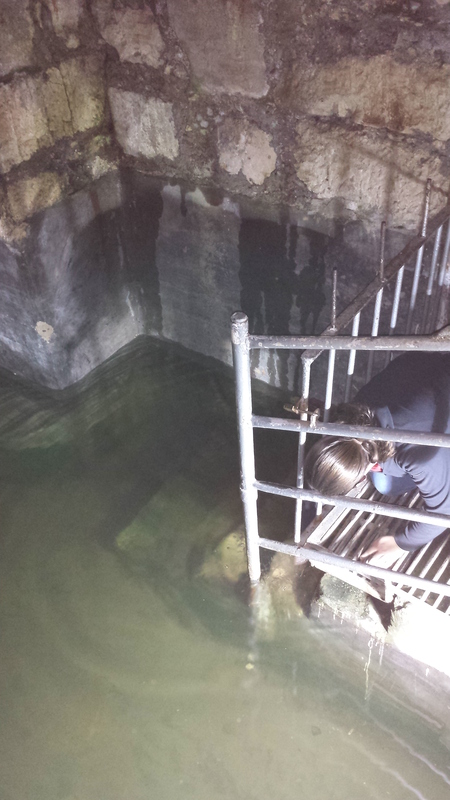 A few of us descended down the narrow steps to view a smaller pool that still remains. I even gathered some water from the pool to bring home! 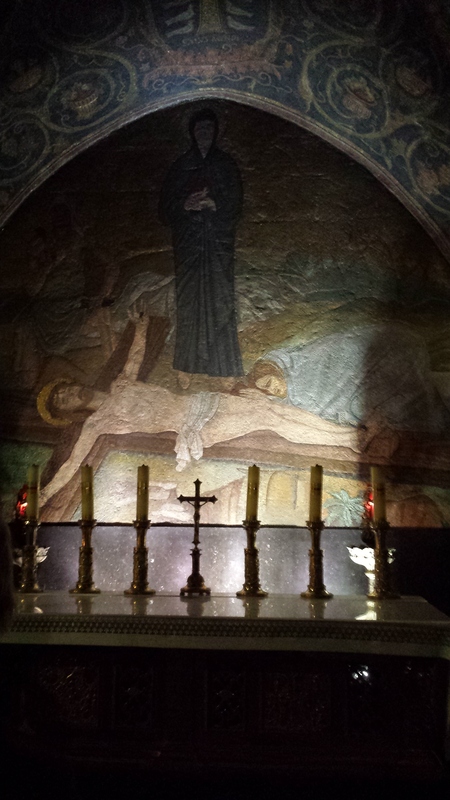 At this ancient place of healing the bishops of our group offered anointing to those of us who wanted to receive it. 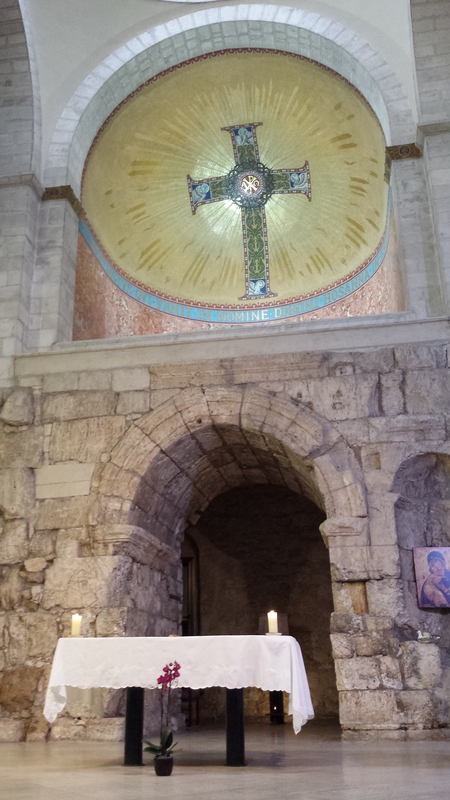 What important about this church is that it is built over the ruins of the first century barracks of the Roman soldiers – it is the location of the archway and courtyard that is the setting for Jesus being mistreated by his guards, dressed like a king and ridiculed, flogged and ultimately given his cross to carry to his execution. 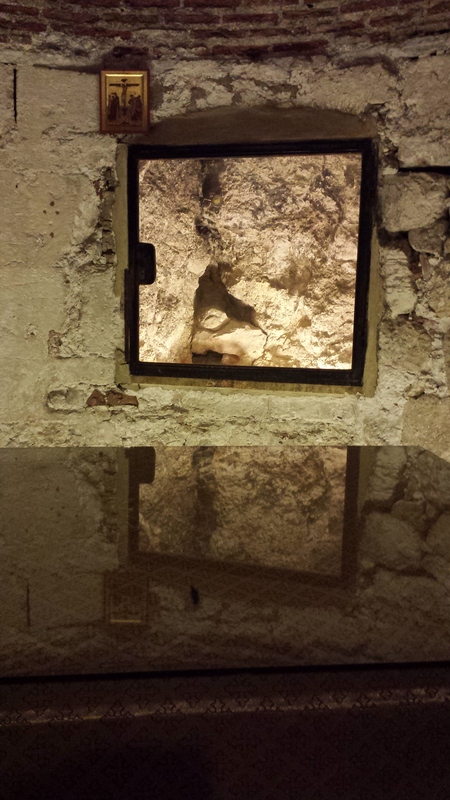 The first two Stations of the Cross are located deep underneath the convent, on the occupation level of first century. 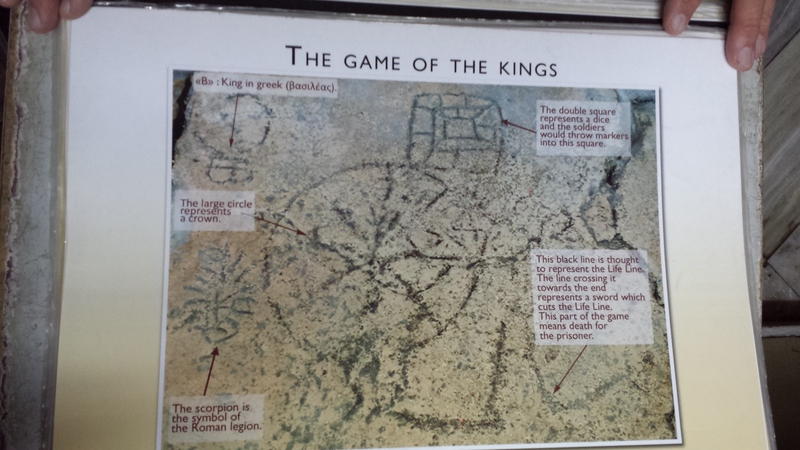 There, carved into one of the stones that would have paved the courtyard, is a game known as “the king’s game” which is likely the gambling game the soldiers were playing – first with Jesus’s life and later for his clothes. 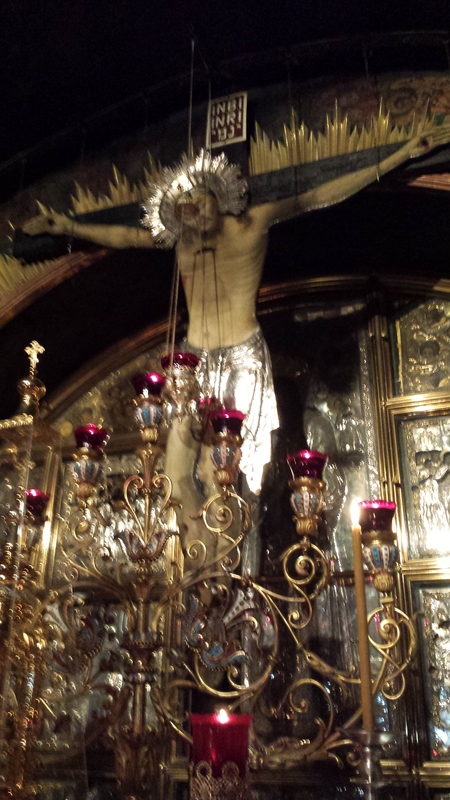 We made our way along each of the Stations of the Cross, winding through the bustling suk with all manner of activity going on around us until we reached the final stations located within the Church of the Holy Sepulcher. 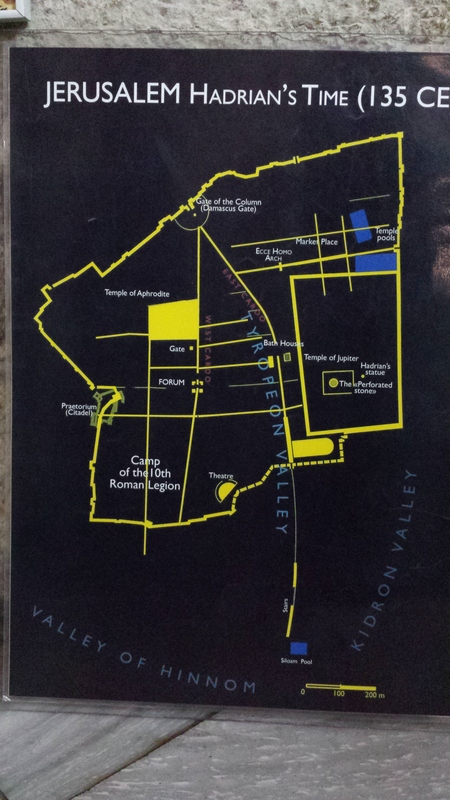 A map showing that at the time of Jesus’ crucifixion, the location was outside the city wall. 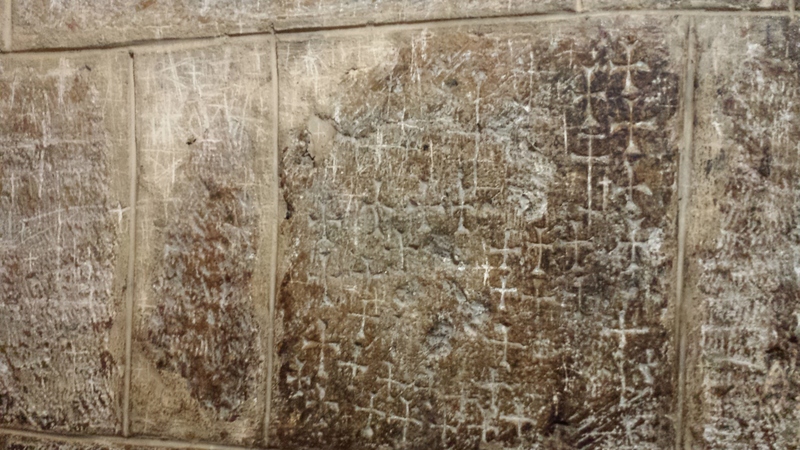 The church contains some of the most authentic sites associated with the location of his crucifixion and initial burial. 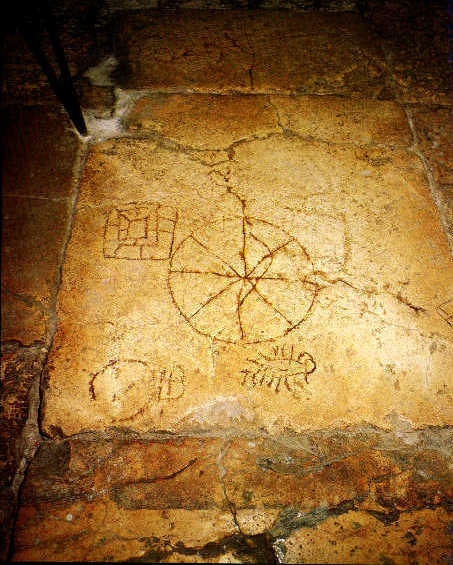 The church also contains a powerful commemoration of the anointing of his body prior to burial that is a large “anointing stone” inlaid in the floor near the entrance of the church. The stone is overhung with large lamps and has a beautiful mosaic on the wall immediately behind the hanging lamps and stone. 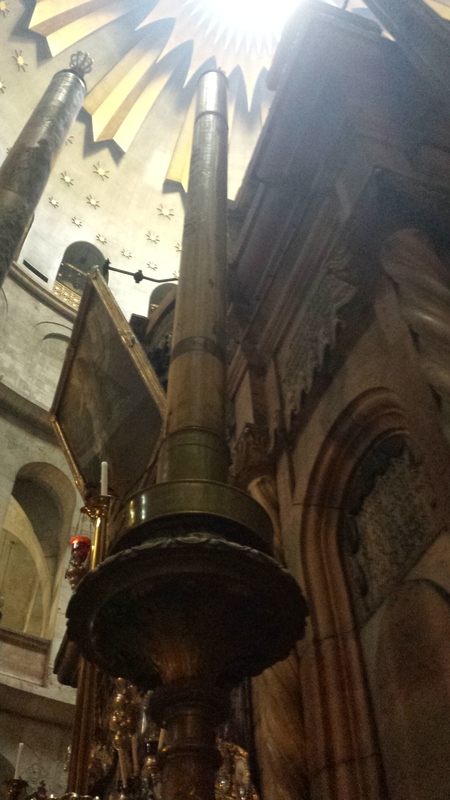 There is also a very ornate and large tomb building called the Aedicule, said to be built over the tomb where Jesus was laid. Bishop Greg at the shrine. 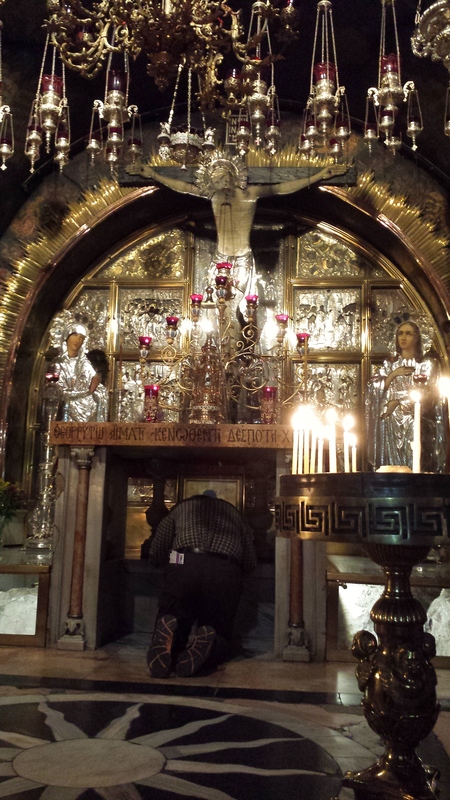 Pilgrims can kneel under the altar and reach down through a hole to touch the bed rock. The primary custodians of the church are the Eastern Orthodox, Armenian Apostolic and Roman Catholic churches, with the Greek Orthodox having the lion’s share. The Coptic Orthodox and Ethiopian Orthodox as well as the Syrian Orthodox have lesser responsibilities. In 1853 an agreement between the churches known as The Status Quo clarified which communities were responsible for which aspects of the large church, with times and places of worship strictly regulated. No part of the church may be rearranged without the consent of all communities. In 1852, a wooden ladder was placed on a window ledge over the church’s entrance at a time when the window ledge was considered common ground. 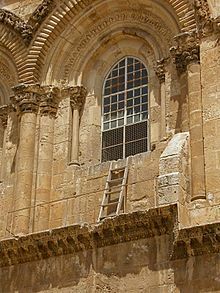 This ladder, known as “the immovable ladder” remains in place to this day. 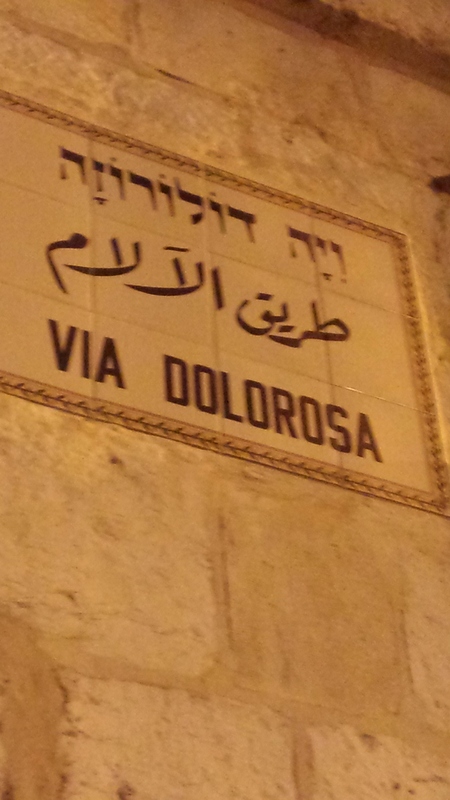 After our journey of the Via Dolorosa, we had lunch back at the hotel before a series of experiences related to learning about the perspective of Israeli settlers in Palestine and Israeli Jews in East Jerusalem. We heard an informational presentation before boarding the bus – this time guided by an Israeli settler. We drove into a nearby settlement, where we met with several settlers, many of whom immigrated here from the United States (California, Texas and Colorado). Finally, we drove to the home of a Jewish lawyer, who boarded our bus to give his presentation there. 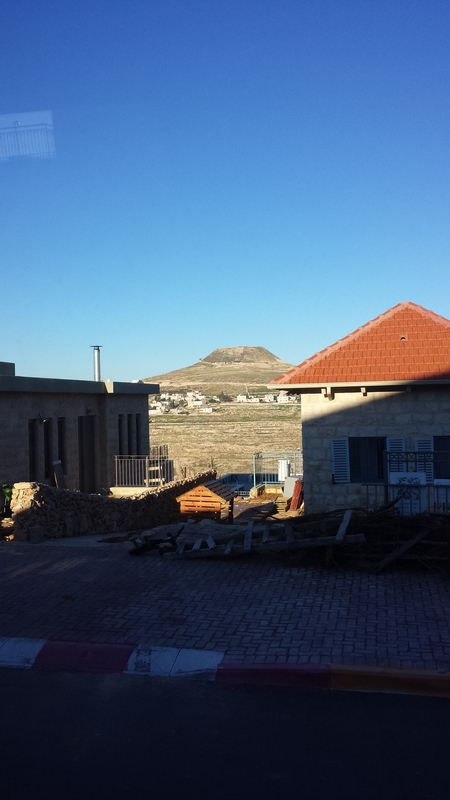 Visiting a Jewish Settlement, Mount Herodian in the background. This whole experience of the afternoon was actually extremely saddening. 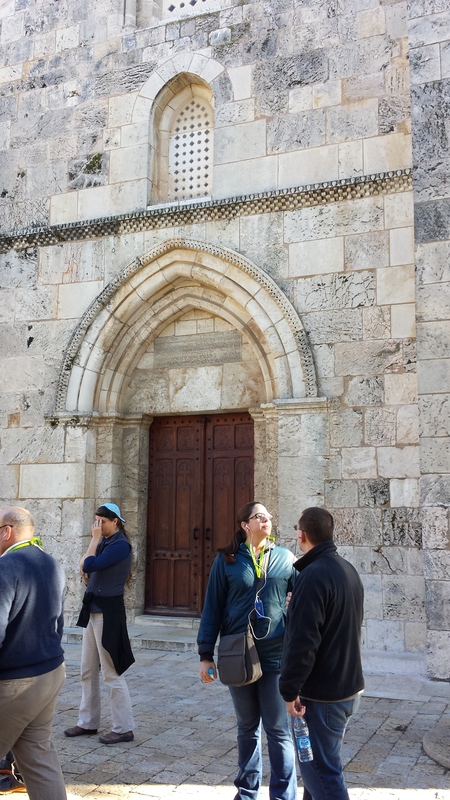 In fact, Rachel was so upset by the racist, paternalistic, colonialist and ideological stance that the Jewish settlers shared about Palestinians that after we returned to the hotel, she joined a group going back to the Church of the Holy Sepulcher to pray. However, even after that visit, she still felt depressed and unsettled. 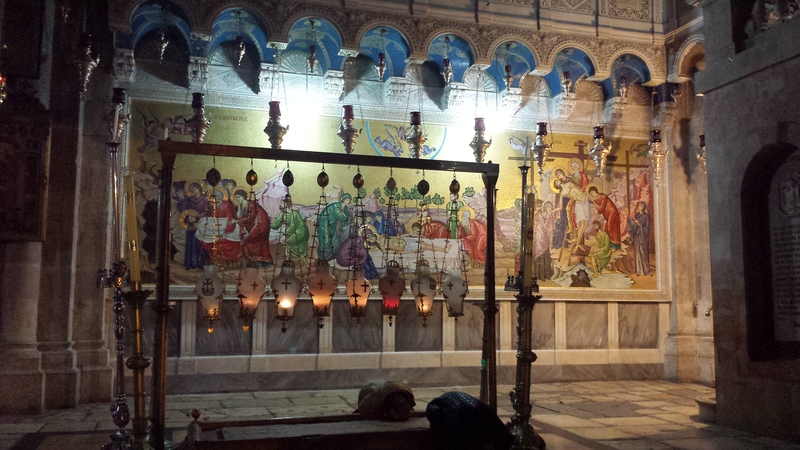 But, then, on the way back to the hotel – once again walking through the suk – she felt drawn to enter a shop of icons made by the Greek Orthodox monastery in Jerusalem. The shop keep, Anton, patiently set out the icons of various sizes tow which she felt drawn. He served her a mug of tea with mint and honey while she sat for some time in front of several icons – the Annunciation, the Burial of Jesus, and a Madonna and Child. I think you’ll like the one she chose, but I’m going to let her share it with you when she gets back. Anton told her to have the icon blessed while she is here, and she’s definitely going to have that done! What matters is that the exercise, reflection and gentle hospitality of Anton all served to bring her back to calm. She felt healed and rested and finally went to dinner. Our group had a long and important debriefing session after dinner, and now I’m finally caught up on my blog.